Modified Radical Mastectomy (MRM) is the most common surgical procedure for operable breast malignancies. Based on current incidence rates, 12.4% of women born in the United States at present will develop breast cancer at some time during their lifetime. Following mastectomy, the patients are emotionally disturbed apart from the physical suffering. Various strategies like non-steroidal anti-inflammatory drugs, opioids, peripheral nerve blocks, wound infiltration with local anaesthetics, wherever possible were found to have significantly improved the postoperative pain. Despite these improvements, several studies reported that limited success in providing effective postoperative pain control. The technique of infiltration or irrigation of local anaesthetic is widely used as a part of multimodal analgesia in plastic reconstructive breast surgery, with remarkable effectiveness and without adverse effects. , In contrast to other breast surgeries, MRM involves more extensive tissue dissection. Medline search showed scant literature regarding the use of infiltration/irrigation of local anaesthetics following the MRM. Infiltration of local anaesthetic along the line of incision is not recommended in malignant lesions, because of the fear of needle track seedlings and cutaneous spread of malignancy. Moreover, the tissue dissection extends beyond the surgical incision. Infiltration along the line of surgical incision may not provide adequate analgesia. The aim of the present study was to assess the role of wound instillation with bupivacaine through surgical drains in alleviating early postoperative pain after the MRM. Normal saline is commonly used as a "control" group for the clinical investigations. However, as there was a prolongation in the duration of analgesia, , we have compared saline with bupivacaine and "no instillation" as a control group. The primary objective of the study was the efficacy of the wound instillation through surgically placed drains, which was assessed by duration of analgesia, number of analgesic demands and cumulative analgesic requirement for pain relief. We hypothesised that in patients following the MRM, instillation of local anaesthetic through axillary and chest drains placed surgically may provide a better analgesia. Institutional ethics committee approval was obtained for this randomised prospective, controlled, double-blinded study and written informed consent was obtained from the patients. This study was conducted on 60 American Society of Anaesthesiologists' physical status of I and II patients, aged 45-60 years, scheduled for the MRM procedure. Patients with a history of clinically significant cardiovascular, pulmonary, hepatic, renal, neurologic, and psychiatric or metabolic disease were excluded from the study. Patients with a history of chronic analgesic drug usage (on oral analgesics for more than a month) were also excluded from the study. Patient's with major blood loss and unpredictable action of the drug such as continued excessive blood collection into the drains were excluded following recruitment. All perioperative data were collected by an investigator, who was blinded to the patient's allocation. Pre-anaesthetic medication consisted of tablet pantoprazole 40 mg and alprazolam 0.5 mg administered orally on the morning of surgery. Preoperatively, all patients were educated in rating the visual analogue score for pain. A standard general anaesthesia was induced with propofol 2 mg/kg and the opioid used was fentanyl at 2 μg/kg. Trachea was intubated with appropriate sized endotracheal tube, which was facilitated with atracurium besylate 0.1 mg/kg. Oxygen in nitrous oxide mixture in a ratio of 30:70, and end tidal concentrations of sevoflurane of 1-2%. were maintained throughout the operative period. At the end of the surgical procedure, two drains, one in the axilla near the axillary vessels and the second in the chest wall below the skin flap (over the pectoral muscles) were placed by the surgeon before closing the surgical incision. Patients were randomly allocated to three groups of 20 each by computer generated numbers. The study drug was given through each drain as per randomisation after the incision was closed. Group C patients received no instillation and considered as control group. Group S patients received 20 ml of normal saline through each drain amounting to 40 ml and Group B patients received 40 ml of 0.25% bupivacaine, 20 ml through each of the drain. After instillation of the study drug the drains were clamped for a period of 10 min. After a dwell time of 10 min, the clamp was released to allow the test solution in to the negative pressure suction drain (Romo Vac). Tracheal extubation was performed upon meeting the criteria for extubation and after reversal of residual neuromuscular blockade with neostigmine and glycopyrrolate. Postextubation patients were transferred to the postanaesthesia care unit for further monitoring. Intraoperative haemodynamic parameters were controlled by adjusting the dial concentration of sevoflurane. Pain score at "0" h was noted after extubation and subsequently every 4 th hourly by a trained postoperative nurse for 24 h, who was blinded to the study group. Pain scores both static visual analog scale (VAS) and dynamic (DVAS) were assessed using a 10-cm VAS (0 - no pain and 10 - worst imaginable pain) VAS was noted as pain at rest and DVAS was noted as pain on moving the ipsilateral arm. If the VAS exceeded '4' at any point of time, rescue analgesia with injection tramadol 1 mg/kg intramuscular was administered. The duration of analgesia was defined from the time of instillation of the study drug to the time for the first demand of analgesia. The number of demands and the total cumulative analgesic requirement were also noted for 24 h. Surgical site related untoward effects like haematoma, infection and wound dehiscence were observed clinically till the patient was discharged home. Adverse effects like nausea and vomiting were not noted as all patients received prophylactic antiemetic ondansetron. Statistical analysis was performed using SPSS version 13 Chicago IL. 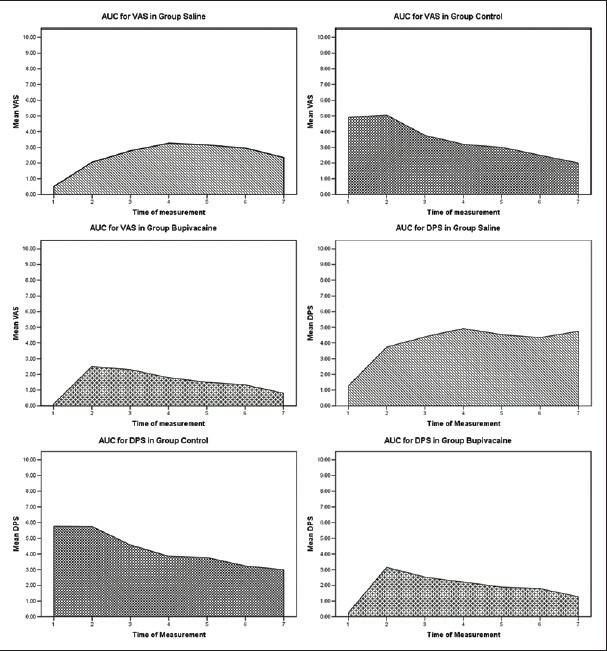 Prestudy power analysis based on the duration of postoperative analgesia, which was carried out on the pilot study (10 patients which were not included in the main study) determined a sample size of18 each for the 3 groups to be compared by one-way ANOVA, whose means of 4.8, 10.3 and 13.6 h with a variation in the means of 3.6 and a common standard deviation within the group of 8.1. The total sample of 54 subjects achieved 82% power to detect differences among the means versus the alternative of equal means using an F-test with a 0.05 significance level. Data were expressed as mean values ± SD Normality of distribution was assessed using the Kolmogorov-Smirnov test. Depending on the results, either parametric or nonparametric tests were performed. Normally distributed continuous data were analysed and compared using the ANOVA. Post-hoc analysis was performed using Bonferroni test. Number of patients receiving "rescue" analgesia, number of analgesic demands was analysed by using χ2 test or Fisher's exact test as appropriate. Patient-generated VAS, an ordered categorical variable was analysed by using the Kruskal-Wallis test. To obtain a composite value for the pain score distributed over a period of 24 h, an area under curve (AUC) for the pain score of each patient was determined. This AUC for VAS and DVAS was compared between the groups using ANOVA. A P < 0.05 was considered statistically significant for all tests. The median time for onset of pain was determined, and the risk of developing pain was compared between the three groups by Kaplan-Meier analysis. The three groups were comparable with respect to demographic data and duration of surgery [Table 1]. The number of rescue analgesic demands was higher in the Group C than Group B and Group S but there was no significant difference between Group B and Group S. The rescue analgesic requirement was higher in the Group C than Group B (P < 0.0001) and Group S (P = 0.005) but there was no significant difference between Group B and Group S (P = 0.56). Patients in the Group B had significantly lower pain scores at rest and on movement as compared with Group S and C at all-time points assessed [Figure 1]. In Group S the pain scores were less than the control group but higher, when compared to Group B. 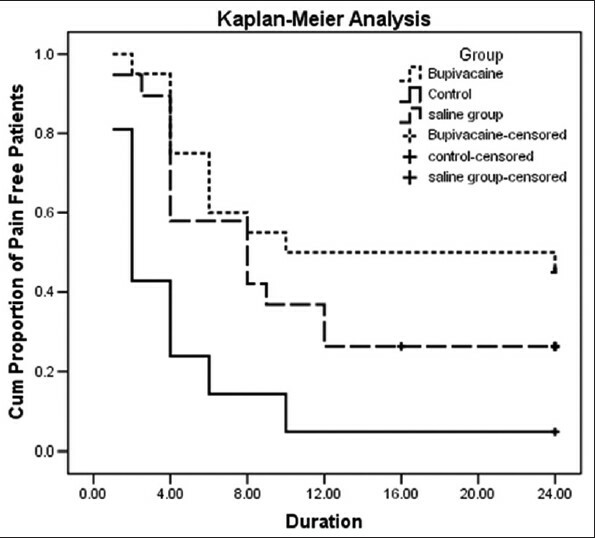 The mean duration of block in bupivacaine group was 14.6 h, where as it was 10.3 h in saline group and 4.3 h in control group. There was a significant difference between Group C and Group B (P < 0.0001). The analgesia with saline was variable and there was no difference in the duration of analgesia, when compared to Group C (P = 0.059) or Group B (P = 0.266). [Figure 2] shows the cumulative risk of onset of pain. It was significantly lower in Group B than Group S and Group C. The AUC for the DVAS score in Group B was significantly higher than Group C (P = 0.001) and Group S (P = 0.002) but there was no difference between Group S and Group C (P = 1). Similarly, AUC for VAS was significantly higher in Group B than Group C (P < 0.0001) and Group S (P = 0.003) but there was no difference between Group S and Group C (P = 0.064) [Table 1] and [Figure 2]. There were no wound haematomas, infection or delayed wound healing in any of the patients. In this prospective, randomised controlled study, the results showed that patients, who received instillation with 0.25% bupivacaine through surgical drains following MRM procedure experienced a better postoperative analgesia as compared with patients who received saline similarly, and also the control group. 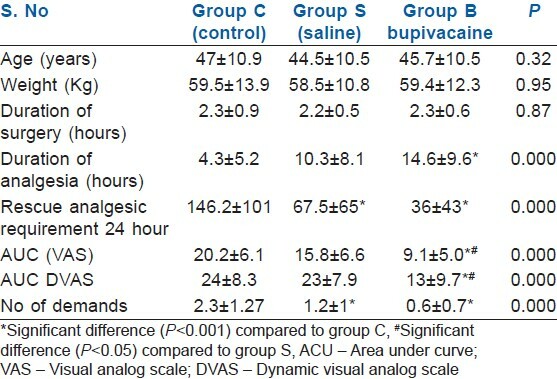 Cumulative rescue analgesic consumption and number of demands for analgesia in the first 24 h, when the pain score was ≥4  was significantly lower in the bupivacaine group compared with the saline group and control groups (P = 0.00). The techniques like paravertebral block, brachial plexus block by infraclavicular approach have been tried for postoperative analgesia following mastectomy. ,, Arunakul and Ruksa  found that single injection of paravertebral block (PVB) reduced pain scores and opioid consumption in MRM. However, these techniques are laborious and technically challenging. Infiltration of local anaesthetic along the suture line also provides analgesia ,, but, for malignant lesions this method may not be recommended because of fear of needle track seedlings and cutaneous spread of malignancy. Sidiropoulou and his colleagues  in their study compared analgesic effect of single injection of PVB with ropivacaine and continuous irrigation of wound with ropivacaine through two dedicated multi-lumen catheters placed subcutaneously at the end of the procedure following mastectomy for 24 h. They found that early postoperative analgesia (4 h) was good with PVB and late postoperative analgesia was good with continuous irrigation and concluded that continuous wound irrigation is as effective as PVB with low pain scores and good patient satisfaction. The technique of drug instillation through the drains is technically simple, and operation theatre time is also not a constraint because it takes very little time to instill the drug through the drains. The technique of instillation of the drug through drains is well established in surgical procedures like laparoscopic cholecystectomy, , abdominal hysterectomy , where the results have shown some positive impact on postoperative analgesia. Moreover, this is well accepted by the patient and the surgeons. But in a study by Fredman et al. it was seen that after major abdominal surgery repeated wound instillation of 0.25% bupivacaine solution via an electronic patient-controlled analgesia (PCA) device and a double-catheter system did not decrease postoperative pain or opioid requirements. Here the authors opined that the lack of uniform distribution or rather spread of the drug was unpredictable, and also the dose of the local anaesthetic was insufficient. However, there is sparse literature regarding its use in the MRM procedure. In a study by Legeby et al. following breast reconstruction surgery, levobupivacaine injected locally every 3 rd h as a supplement to paracetamol orally, and morphine given by PCA resulted in improved pain relief at rest and during mobilization compared with placebo. Talbot et al. in their study to determine the effect of local anaesthetic irrigation of axillary drains on postoperative pain following a modified Patey mastectomy felt it did not appear to offer any contribution for postoperative analgesia in some of their patients. They opined that this could be because of malpositioned drain, blockade of some holes of the drain or unequal distribution of the local anaesthetic due to gravity and concluded that further refinement in the technique was needed. We have instilled through both the chest wall and axillary drains placed to overcome this limitation. This could have resulted in more uniform distribution of the drug improving the efficacy of the technique, and the patients were pain free in the postoperative period. The initial pilot study was conducted with saline as control. We noticed that there was a prolonged period of pain relief even with saline as compared to our experience without instillation. Hence, we sought to find an explanation for the analgesia with saline and a control group with no instillation was introduced in the study design. Normal saline producing analgesia is known in gynaecological practice for fractional curettage  and a similar observation was made with palatal block for postoperative analgesia following cleft palate surgery. In this study though the saline produced analgesia, it was not consistent. The probable mechanism being pressure over the nerve endings, thereby blocking the conduction of nerve impulses and producing analgesia. In the present study, the patients who received saline as the test solution also had low pain scores with a mean duration of analgesia of 10.3 h compared to 4.3 h in the control group. Another probable mechanism being washing away or diluting the pain producing substances, and the inflammatory mediators thereby decreasing the postoperative pain. There are certain limitations in this study. Firstly, wound instillation as mode of analgesia was compared with control and was not compared with any other existing modalities of analgesia. Secondly, long term follow up of the patient's pain was not evaluated. Wound instillation with local anaesthetics is a simple, effective and inexpensive means of providing good analgesia for patients following the MRM procedure without any major side-effects. Wound infection and healing do not appear to be a major concern. Local anaesthetics are generally well tolerated, provided they are used correctly and in the correct doses. This technique of providing postoperative analgesia can be included in the armamentarium of multimodal analgesia. The authors are indebted to Prof. G. S. N. Raju for his kind cooperation in the conduct of this study. Howlader N, Noone AM, Krapcho M, Garshell J, Neyman N, Altekruse SF, et al. Cancer Statistics Review, 1975-2010. Bethesda, MD: National Cancer Institute; 2012. (Based on November 2012 SEER data submission, posted to the SEER web site). Available from: http://www.seer.cancer.gov/csr/1975_2010/. [Last accessed on 2013 Jan 30]. Fayman M, Beeton A, Potgieter E, Becker PJ. Comparative analysis of bupivacaine and ropivacaine for infiltration analgesia for bilateral breast surgery. Aesthetic Plast Surg 2003;27:100-3. Lu L, Fine NA. The efficacy of continuous local anesthetic infiltration in breast surgery: Reduction mammaplasty and reconstruction. Plast Reconstr Surg 2005;115:1927-34. Uematsu T, Kasami M. Risk of needle tract seeding of breast cancer: Cytological results derived from core wash material. Breast Cancer Res Treat 2008;110:51-5. Chanrachakul B, Likittanasombut P, O-Prasertsawat P, Herabutya Y. Lidocaine versus plain saline for pain relief in fractional curettage: A randomized controlled trial. Obstet Gynecol 2001;98:592-5. Jonnavithula N, Durga P, Madduri V, Ramachandran G, Nuvvula R, Srikanth R, et al. Efficacy of palatal block for analgesia following palatoplasty in children with cleft palate. Paediatr Anaesth 2010;20:727-33. Jonnavithula N, Pisapati MV, Durga P, Krishnamurthy V, Chilumu R, Reddy B. Efficacy of peritubal local anesthetic infiltration in alleviating postoperative pain in percutaneous nephrolithotomy. J Endourol 2009;23:857-60. Culliford AT 4 th , Spector JA, Flores RL, Louie O, Choi M, Karp NS. Intraoperative Sensorcaine significantly improves postoperative pain management in outpatient reduction mammaplasty. Plast Reconstr Surg 2007;120:840-4. Kazmier FR, Henry SL, Christiansen D, Puckett CL. A prospective, randomized, double-blind, controlled trial of continuous local anesthetic infusion in cosmetic breast augmentation. Plast Reconstr Surg 2008;121:711-5. Coveney E, Weltz CR, Greengrass R, Iglehart JD, Leight GS, Steele SM, et al. Use of paravertebral block anaesthesia in the surgical management of breast cancer: Experience in 156 cases. Ann Surg 1998;227:496-501. Bhuvaneswari V, Wig J, Mathew PJ, Singh G. Post-operative pain and analgesic requirements after paravertebral block for mastectomy: A randomized controlled trial of different concentrations of bupivacaine and fentanyl. Indian J Anaesth 2012;56:34-9. Fassoulaki A. Brachial plexus block for pain relief after modified radical mastectomy. Anesth Analg 1982;61:986-7. Arunakul P, Ruksa A. General anesthesia with thoracic paravertebral block for modified radical mastectomy. J Med Assoc Thai 2010;93 Suppl 7:S149-53. Saeidi M, Aghadavoudi O, Sadeghi MM, Mansouri M. The efficacy of preventive parasternal single injection of bupivacaine on intubation time, blood gas parameters, narcotic requirement, and pain relief after open heart surgery: A randomized clinical trial study. J Res Med Sci 2011;16:477-83. Gupta A, Thörn SE, Axelsson K, Larsson LG, Agren G, Holmström B, et al. Postoperative pain relief using intermittent injections of 0.5% ropivacaine through a catheter after laparoscopic cholecystectomy. Anesth Analg 2002;95:450-6. Sidiropoulou T, Buonomo O, Fabbi E, Silvi MB, Kostopanagiotou G, Sabato AF, et al. A prospective comparison of continuous wound infiltration with ropivacaine versus single-injection paravertebral block after modified radical mastectomy. Anesth Analg 2008;106:997-1001. Pfeiffer U, Dodson ME, Van Mourik G, Kirby J, McLoughlin GA. Wound instillation for postoperative pain relief: A comparison between bupivacaine and saline in patients undergoing aortic surgery. Ann Vasc Surg 1991;5:80-4. Zohar E, Fredman B, Phillipov A, Jedeikin R, Shapiro A. The analgesic efficacy of patient-controlled bupivacaine wound instillation after total abdominal hysterectomy with bilateral salpingo-oophorectomy. Anesth Analg 2001;93:482-7. Levack ID, Holmes JD, Robertson GS. Abdominal wound perfusion for the relief of postoperative pain. Br J Anaesth 1986;58:615-9. Fredman B, Zohar E, Tarabykin A, Shapiro A, Mayo A, Klein E, et al. Bupivacaine wound instillation via an electronic patient-controlled analgesia device and a double-catheter system does not decrease postoperative pain or opioid requirements after major abdominal surgery. Anesth Analg 2001;92:189-93. Legeby M, Jurell G, Beausang-Linder M, Olofsson C. Placebo-controlled trial of local anaesthesia for treatment of pain after breast reconstruction. Scand J Plast Reconstr Surg Hand Surg 2009;43:315-9. Talbot H, Hutchinson SP, Edbrooke DL, Wrench I, Kohlhardt SR. Evaluation of a local anaesthesia regimen following mastectomy. Anaesthesia 2004;59:664-7.